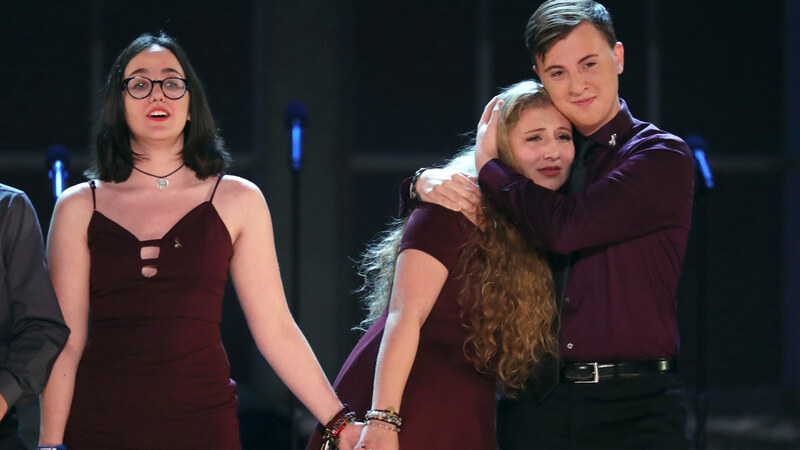 By far the most emotional moment of the Tony Awards Sunday night evoked the nation's divisions over gun reform, when Melody Herzfeld, drama teacher at Marjory Stoneman Douglas High School in Parkland, Florida, was honored from the stage. Herzfeld, the one-woman drama department at the school, has been credited with saving lives by barricading students into a classroom closet during the Valentine's Day mass shooting that killed 17 people. She later encouraged many of her pupils to lead the nationwide movement for gun reform. Herzfeld gave her acceptance speech during the pre-show. During the show, actor Matt Morrison welcomed the Marjory Stoneman Douglas High School theater department to the stage. The students then surprised the audience by singing "Seasons of Love" from the musical "Rent."